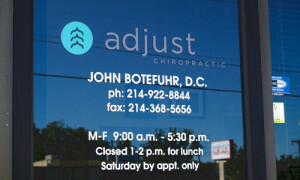 Adjust Chiropractic, home of Drs. John Botefuhr and Anne Maurer! Call us at (214) 922-8844! 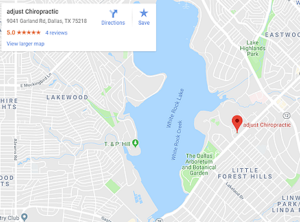 Growing up in Dallas, Dr. Botefuhr knew he wanted to start his chiropractic clinic here in East Dallas. A Dallas native and Highland Park High School graduate, Dr. John Botefuhr received a Bachelor of Arts in Psychology from the University of Oklahoma. Upon graduation, Dr. Botefuhr worked at Hillcrest Hospital in Oklahoma City for 3 years and interned as a Physical Therapy aide at St. Vincent’s Hospital in Santa Fe, New Mexico. Dr. Botefuhr went on to receive a Doctorate of Chiropractic from Cleveland Chiropractic College in Los Angeles. With over 18 years of experience in chiropractic care, Dr. John Botefuhr specializes in gentle, functional, and effective care for pain and sports injuries as well as workers compensation and personal injuries. Dr. Anne Maurer originally hails from Virginia, having practiced in the suburbs of Washington, DC and Philadelphia before moving to Texas. She is devoted to a conservative understanding in the treatment of chronic pain and injury with a strong focus on sports injuries, personal injury cases, and pregnancy pains. Dr. Maurer has worked with a variety of patients ranging from Olympic-aspiring athletes to pregnant women and seasoned moms. She is listed on coccyx.org due to her knowledge of tailbone pain and coccygeal injuries such as those suffered during pregnancy or slips and falls. Her special interest is using gentle chiropractic care as a first-line treatment for rehabilitation and reducing pain. Dr. Maurer completed her undergraduate degree in Neuroscience from the College of William & Mary and earned her Doctorate of Chiropractic from Northwestern Health Sciences University in Minneapolis. She is licensed by the Texas State Board of Chiropractic, Pennsylvania Chiropractic Board, and the Virginia Board of Medicine. Outside the office, she can be found running nature trails or practicing yoga by White Rock Lake. 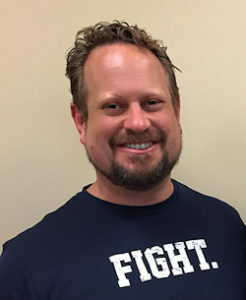 Dr. Maurer also serves as Chief Operations Officer for the Forward Thinking Chiropractic Alliance (FTCA), an international chiropractic organization dedicated to assisting doctors and chiropractic students utilize kind, conservative, evidence-based care. Griselda Perez is the office manager at adjust Chiropractic. She demonstrates solid knowledge of HIPAA, medical billing concepts, and medical terminology, with extensive knowledge of insurance and cash policies. She has over 10 years of experience with timely management of all types of claims as assigned. She is a great patient advocate with attorneys, insurance companies, and healthcare providers, and is an invaluable member of our team. She always has a smile. Griselda speaks fluent Spanish, and serves as a translator for our office.